Now that we have a little one at home, it is much harder to get out for date night. We have been getting really creative over here to still have quality time date nights that can be done after the kiddo is in bed. We have done many of the at-home date nights from The Dating Divas site (it has totally saved date night for us in our situation! ), and this YouTube date has been our favorite one so far! Not only can it be done at home, but it is free, easy to prep, relaxing and super fun! I am constantly amazed at the amount of information you can find on the internet – including, and especially on YouTube! It has everything from educational videos, to product reviews, to tutorials, to date night ideas (shameless plug for our own Dating Diva YouTube channel!) to HIL-arious videos (my favorite!). You name it and you can probably find it on YouTube. 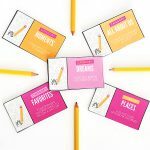 One day while browsing through the site, I thought – this could be a fun date night and with the creative genius of our talented designer Carisa from Messes to Memories, a date night was made! Since this date night is all about watching unique videos on YouTube, I thought it might be fun to send my spouse a video invitation. I had Carisa create a little video file and I texted it to my hubby to get him excited for the date! You can download this video file at the bottom of this post or right-click on the video and select download. 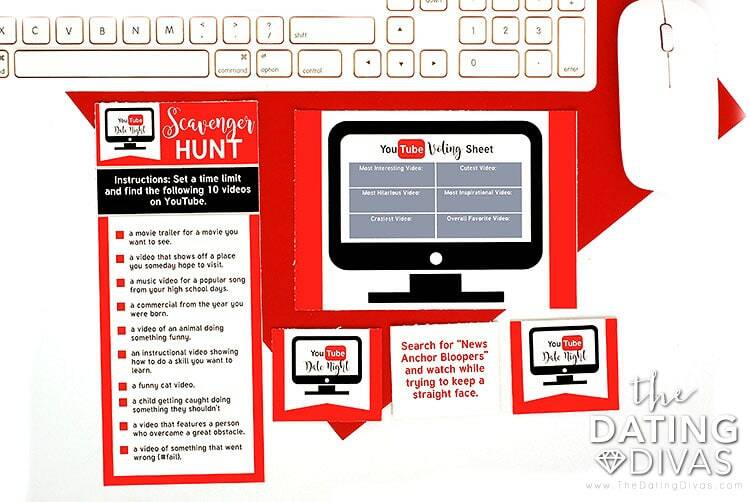 For the first activity, we have a YouTube scavenger hunt! You can play this so many ways depending on how much time you have and whether you want to work together or surprise each other with your findings. We decided to divide the list up since we each have our own computer. I took half of the list and my husband took the other half. We gave ourselves 10 minutes to find our assigned videos from the list. Then, we showed each other the videos we found! I can’t even tell you how fun it was! Watching the “music video for a popular song from your high school days,” ahem, The Macarena, was hilarious and we were both in tears watching the “video that features a person who overcame a great obstacle” that my husband found! The next part of the date includes challenges! 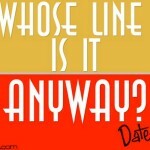 There are a dozen challenge cards included in this date with different tasks to complete with your spouse! 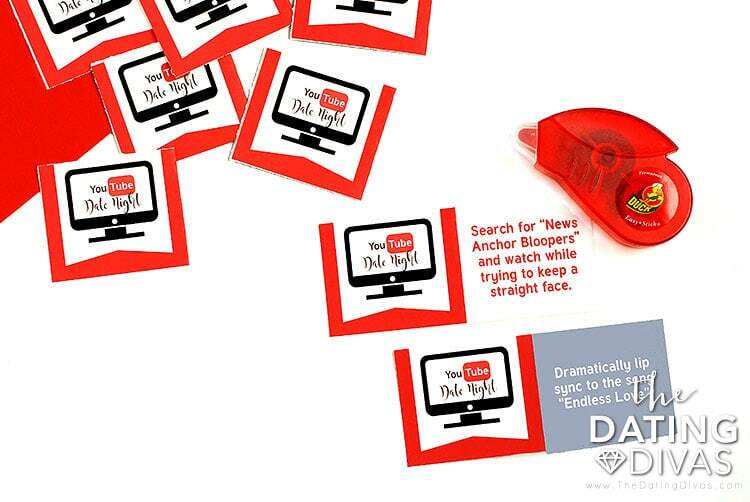 They range from watching a video to learning a new skill, to trying not to laugh during a funny video. We totally failed at the challenge to not laugh during a “Try Not To Laugh Video Challenge Video“. It was practically impossible for us and seemed to make us laugh even more! To make your challenge cards, just fold them in half, and use a glue dot or double stick adhesive tape to stick the front and back together. Finally, after an evening of so many videos, take some time to vote on your favorite overall videos in several categories. It will be fun to compare as well as remember the best videos you saw throughout the night! The best part about this date night is that you could technically do it more than once. 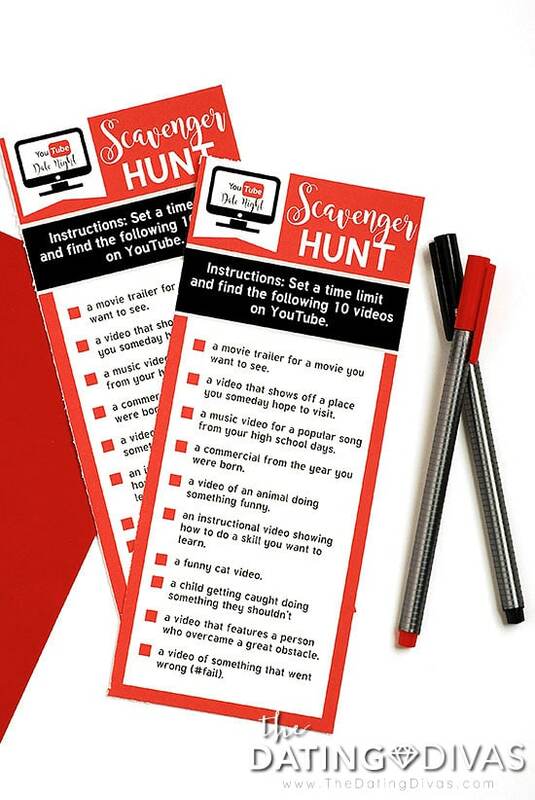 You can do the scavenger hunt and even most of the challenges over again and just find a different video that matches the challenge. There are so many videos out there! We actually didn’t even finish all of the challenges in one evening so we have another date night ready to go for next time! I hope that you have as much fun on this date as we did! 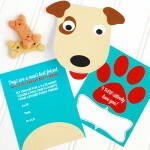 To get your printables for this date (including the video invitation) just click the links below! 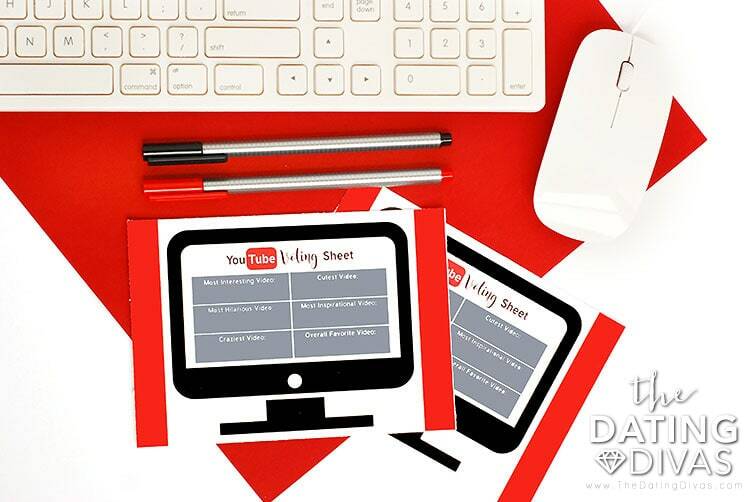 To make this Youtube Date Night all come together, be sure to grab a great quality paper cutter and nice cardstock oh and maybe some chocolate or popcorn! For more date nights that you can do from home, check out our Believe It Or Not Date Night where you and your spouse can watch a series of unbelievable videos! Oh my gosh! Bahaha! The surfer dude is awesome! I’m still laughing! I love this idea. Adam and I do this on occasion ’cause it’s like comedy hour on youtube! Thanks for posting these. I haven’t seen some of them before so it will go perfectly for the next time we do a youtube date. Love it! Clever Jason and Kristen! I love this! 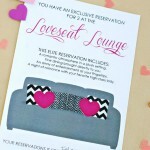 OMG I love this idea and am totally going to use it for our next monthly at home date night! Some of the funniest vids out there are the condom commercials…beware! Some are a little risque. Love this Kristen! We have done this before too! Seriously the best! My husband and I recently watched videos of “fainting goats”. We definitely had a laugh out loud moment “together”! What a great idea… always looking for ways to make evenings not so ho-hum, since we can’t go out after our daughter goes to bed. Thanks for your website –> hoping to add some new fun and sizzle to our marriage with some of your ideas! It’s great to hear positive feedback. Thanks so much! My husband and I did something very similar to this. Our two boys were with their grandparents for the night, we were so excited to go out and have a dinner date. The weather turned really bad and we did not want to take any chances, so we stayed in. He popped over the laptop and I was like really? Then we started watching old music videos from when we were teenagers, and telling funny things it reminded us of. We had a blast and then he played our song, and the evening was complete. Great memories, fun date night. WOW what a fun date and great printables to boot! Adding this to our schedule now!